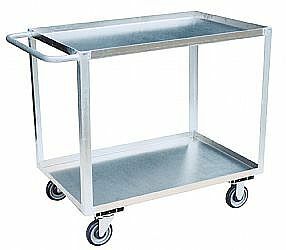 All welded construction (except handles & casters). Platform covered with shock absorbing, non-slip cushioned, non-conductive vinyl matting. Removable 1-1/4â€� tubular handle with smooth radius bend mounted into sockets. Flush platform for easy loading. Bolt on casters, 2 swivel & 2 rigid, for easy replacement. Platform height 31â€� (8â€� casters), 28" (6" casters) and 27â€� (5â€� casters). Handle height above deck - 16â€�.